The great Bud Powell casts a very long shadow over all jazz piano players, not to mention most melodic/harmonic improvisers, regardless of instrument. His best recordings are simply indispensable. However, it is also known to jazz fans that Powell's life "unraveled, after what today would be called a hate crime brought on a crescendo of mental illness and physical damage. Those knowledgeable fans also know that there are quite a few records made from the later years of his life that are sad to listen to because these factors had negative effects on his music. Eternity opens with "Spring is Here (a Rodgers and Hart composition, though strangely no composers are given credit for any of these tunes) and it unfortunately displays some very sloppy playing, perhaps the sloppiest of all the tracks. Yet on "Shaw 'Nuff and "A Night in Tunisia there are moments of brilliancePowell swings hard all the way through both! "Joshua's Blues is touted as a never-recorded Bud Powell original, though it's basically a "simple B-flat blues. Powell's playing, however, is beautiful and grooves hard, and this might have been a wiser choice for the opener. When Powell's melodic thinking is on, it's a marvel to hear him connect phrase after phrase... not only all the right notes, but something you can dance to! The rarely heard "I Hear Music (Burton Lane and Frank Loesser) is given a joyous rendition. We are given a glimpse of Powell's sense of harmonic surprise as well as the sad finger slips. Eternity will have an emotional resonance with lovers of Bud Powell. These piano solos were recorded mostly at the home of Francis Paudras, who offered a "safe haven for Mr. Powell during his stay in Paris ('59-'62). The tapes were willed to Celia Powell (Powell's daughter) and it seems that her decision to release these performances is not casual, as stated in the liners: "In light of much controversy, I believed there was still an audience for the music and wanted to find a way for Bud Powell's fans and would-be-fans to be exposed to his last works. Also included in the CD booklet is a poem "Eternity, written by Powell from the hospital just before he died in 1966. How could this CD not be interesting to jazz fans? 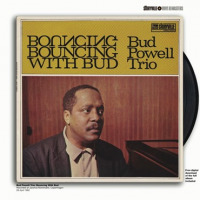 Bud Powell was one of the inventors of bebop and his musical thinking seems to be always inspired, never imitative.